The full moon shone bright. As bright as a perfect bowl of pure silver which had passed through fire. Seven times over. As brave too, for the bluest of darkness surrounding it could not steal even a ray of its light. But little Tarini wanted to steal tonight. She really did! She sat in her cot pushing sleep away and making a staircase with her Lego blocks. To climb, right up to the moon. Why, to steal the rabbit that lives there, of course! Haven’t you heard? Just this afternoon, Lakshmi ma’am had read a story from a very important book, which only grown-ups could touch, about the fluffy rabbit that stays on the moon. As if by divine coincidence, tonight, when the moon was so round and so big, Tarini thought she saw the bunny hop. Twice! She knew instantly that he was very lonely up there, just as she was down here. So, she was going to steal it tonight, get it home and care for it as much as her mother did for her brother. Without a sound, and with dolly her one-eyed confidante by her side. But first things first! She had to build a long stairway to the heavens above. And that is exactly what she was doing, putting block upon block, tongue popping out in concentration, sleepy eyes glancing up to make sure the moon remained, whispering ‘I’m coming to rescue you, bunny. Just wait for me. Be my best friend’. The lonely bunny must have heard her whispers and then her snores which followed close behind. It must have also heard the deep sobs coming from another window. A woman stood there, crying. Tears of desire and longing combined. Beautiful beyond belief she was, and if you were to know her real story she would remind you of Rapunzel in a tower, trapped. She stood staring at the moon which became two dots of silver light in her wet eyes. As if a sign of the power she carried within. Power to love with the ferocity of a huntress, but none to overturn edicts carved with stony old thinking. He’s Muslim, she knew. When her parents came to know they wanted to know no more. The full moon tonight was the last one she would see with unmarried eyes. At least she saw the moon, for her husband’s face she was yet to! Bathed in silver she swam back to when she was little. When the moon meant a rabbit, a fluffy one. And then, those days in the hostel of secret chanting to the old man known to play ‘cupid’ sitting on the moon – “Full moon. Full moon. I hail thee! By all the virtue in thy body, grant this night that I may see he who my true love is to be.” Giggling. Praying to dream about the face of true love, those girls just out of pigtails, but grown up enough for now they bled. She smiled and opened her eyes. How far back it seemed. How juvenile! True love … a tear slipped down her left eye. Sat on the window sill, and then dried. The old man on the moon must have seen it fall. But what could he have done? He looked around. Luna! But the goddess was busy elsewhere. At the ghat which burned with human cries in the day sat a bald woman wrapped in white tonight. Riding on the full moon’s silver palanquin, as if possessed by its rays, she had broken out of her ashram through her lonely window. Could the silver disc in the sky have lead her there, after a fit of hysterical screaming at flashes of memory which she saw as monstrous shapes, only she? The air around was still alive with murmurs, but the water slept calmly. She sat there listening, beads in one hand the other making wild movements on her head as if pulling the hair that wasn’t there. If you saw her you would think she was crazy, but she was just a widow punished with this life because the man she married died. Because of you, for him you did not love, repeated the voices. Accusingly. The same voices. A thought touched her like a gentle breeze does a searing heart, that right below the water was a peaceful kingdom. That is where the moon shone brightest. With a fluffy bunny sitting next to an old man promising her true love. She went down the steps, slowly unwrapping the cotton sari from around her wrinkled frame which formed a trail of chaste white on the holy steps. Soon, Tarini became one with the water. PS: I'm yet to read your story in Mango Chutney. Going by this one, am sure I'll enjoy that one. All the best! Fingers crossed. I sure hope you do! Good to see you here. Sure, will let you know. Got the book a couple of days back. Beautiful! The first story reminds me of a classical bandish : anokha laadla, khelan ko maangey chaand khilona. I have that bandish. I will listen to it today. Happy you read, Dipali. Longing was indeed one of the emotions I wanted to convey. Loved the way you weaved Tarini's story panning it from childhood to finally becoming one with water with moon forming the string. :) Glad you liked it, Jas. Poetic, three stages of Eve with the moon as lietmotif. You made this into a Paradise Lost. Indeed, I could have named it exactly that! It was lyrical, Tarini's story that waxed and waned under the moon. Good to see you here after so long. Oh wow how beautiful was this! The journey of a woman from a child to a widow. Beautiful! I can read this again and again! Glad you liked it, Datta, Very glad. This was a very elegant with its eloquence. Means a lot to hear that, Rickie. Love the 'as always'. :) Many thanks! I see you got the essence of the story, Rajrupa. It reminds me of how one moon seems to many people with different emotional need. Beautifully written Sakshi! That's right, Uma. We see it in the light of our moods, which change in form just like the moon itself. So happy to see readers interpreting this piece of work. And very good to know you read me today, Uma. Thank you. 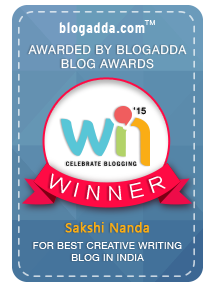 Hey Sakshi wonderful writing. Three stages of life of being a woman from a shimmer to haze. Love your words! Love your comment, Neha. Thanks a lot! How we change our perceptions of the moon. I think, no conquests or discoveries will ever rob the moon of it's enigma. a very lyrical post! Yes, there is a mystery about the moon that will never be conquered. Thanks, Ilakshee. Thank you so much, Rahul. Good to see you on the blog after a long time! Sagarika, you made my day! Love how you have used a constant thing (the Moon) to describe the variations of the girl's life. hmmmmmmm right next full moon I am gonna see it happen too :) who knows..
spooky and the way the girl is changing ..
Good to see you after a hiatus, nevertheless. :) Thank you so much. I love it! Beautifully written. Lovely, absolutely lovely piece. This is one of those pieces you read and you just go quiet. Very quiet. It's one of the pieces I keep coming back to. Somehow.